It is often said that playing experience can help a player transition to refereeing. The same is true from an equipment standpoint. Quite simply, a player will have to purchase less to start officiating than someone who has not played. In fact, for as little as $100, or even less, an individual of any age can be ready (registration requirements aside) to hit the ice as a referee. In fact, one of three “value packages” offered by Officials Wearhouse simply includes a referee sweater, pants, and whistle for under $90. With a budget in mind, USA Hockey Magazine examined officiating equipment on a piece-by-piece basis. We enlisted expert advice from two people with years of experience in refereeing and equipment sales. Officials Wearhouse carries CCM, ITECH, and Bauer/Nike, its biggest seller. “It has the thin padding that many referees like,” says Jeff Fulton, is the ECAC supervisor of officials and owner of Officials Wearhouse, recognized as a household name in referee equipment sales. Any facemask on a player’s helmet will have to be replaced by a half-shield visor, highly recommended for officials by USA Hockey. The half shield will cost around $50. Most are made by Bauer and CCM. For youth-level games, USA Hockey recommends a sweater without the side and under-arm solid black mesh popularized by NHL officials. The older the age level, the more important elbow pads become. Custom-made referee pads are ultra protective and have a preferred thinner, more streamlined look than players‘ elbow pads. This is an area where your novice official has several options. Bauer and CCM pants are commonly worn by officials. Players may use their shin guards, under certain circumstances. “They can’t look too big and bulky underneath the pants,” says Allord. High-quality officials shin guards are easy to come by. A well-maintained all-black skate has been traditionally symbolic of the “professional look” that is considered an essential part of an official’s appearance. An all-black style aside, officials are highly encouraged to use clean, white laces at all times and avoid wearing goalie skates. Many referees feel the girdle is optional when working games at young age levels. “From a safety standpoint, we are seeing a surprising number of tailbone injuries in Mite games,” Fulton says. Obviously, there are many choices and decisions to be made when dressing a referee for the first time. Priority should be given to safety and a clean, neat, professional appearance. 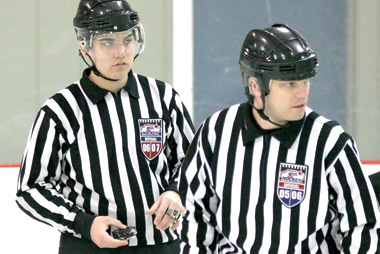 Officials Wearhouse merchandise can be viewed on-line through hockeyreferee.com or at officialswearhouse.com. Pat Britt, Coordinator of USA Hockey’s Officiating Education ProgramUSA Hockey Magazine: When did you first hit the ice? Pat Britt: I started playing hockey when I was 5 years old in Scituate, Mass. I played competitively until I was 20. USAHM: When did you change over to stripes? Pat Britt: I started officiating when I was 13. It was a great way to learn about the game and get some extra ice time. USAHM: What levels have you officiated at? Pat Britt: I started out working in youth hockey and then progressed to the USHL. I also worked minor pro games (ECHL, UHL, WCHL) as well as some IIHF events (5 Nations Cup in Salt Lake City in 2001). USAHM: What is your role in the Officiating Education Program? Pat Britt: I view my job as providing day-to-day support to Matt Leaf and the rest of the Officiating Education Program. This summer I’m working a lot with the development camps, just being around and helping out the camp instructors where I can. USAHM: Have you hung up your stripes for good? Pat Britt: No. I still plan on officiating local youth hockey games this season. But this was the right decision made at the right time. The opportunity to join USA Hockey was too much to pass up. The action of a player who intentionally or recklessly contacts an opponent’s head either with the stick or an illegal body check. The result is a minor penalty, major penalty or major plus game misconduct penalty, at the discretion of the referee. 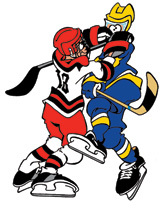 A major plus a game misconduct penalty shall be imposed on any player who injures an opponent by head contact.